What is viscosity? Put simply viscosity is the measure of how fast liquids flow or the resistance to flow of a fluid and the resistance to the movement of an object through a fluid. Stirring your cup of tea is considered easy, this is due to water and milk having low viscosities, while if you were to try and stir a cup of honey you would find this considerably harder as honey is much more viscous. The viscosity of a substance can be affected by temperature as you are probably aware, for example heated honeys and syrups flow much more easily than those which have been pulled cold straight from the fridge. So why are some substances more viscous than others? The flow speed is determined by how much friction exists between the molecules of the liquid as the liquid flows. As to what causes this friction nobody can say for sure however the general consensus is a combination of electromagnetic attraction/repulsion between atoms and long chain molecules looping around each other in complex compounds as in polymers. Newton's equation, states that the resulting shear of a fluid is directly proportional to the force applied and inversely proportional to its viscosity. The similarity to Newton's second law of motion (F = ma) should be apparent. Viscosity is represented by the symbol η "eta" and is the ratio of the shearing stress(F/A) to the velocity gradient (Δvx/Δz) in a fluid. equivalent to newton-second per square metre (N·s m–2). It is sometimes referred to as the “poiseuille” (symbol Pl). One poise is exactly 0.1 Pa·s. One poiseuille is 10 poise or 1000 cP, while 1 cP = 1 mPa·s (one millipascal-second). There are several methods used to obtain measurement of viscosity from various substances. The falling ball viscometer is a simple method used to determine the viscosity of a substance. A sample tube is filled with the test substance which is to be viscosity tested. 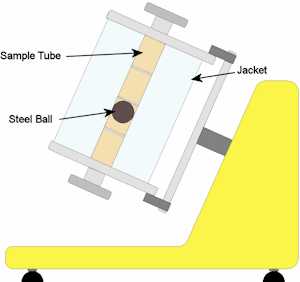 A spherical or column shaped body with known dimensions and density is dropped in free fall through the substance in the sample tube. The time taken for the body to pass between two set points is used to determine the substances viscosity. 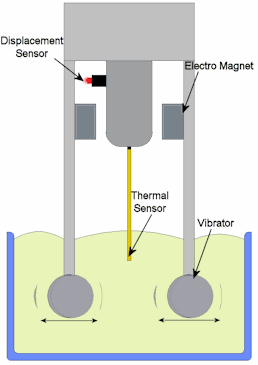 The vibro viscometer works by sending uniform frequency vibrations out from two sensor plates which sit submerged in the sample fluid. The thicker (more viscous) the substance the more driving current is required to maintain the vibration frequency, the viscosity is then worked out by the positive correlation between the driving electric current and the viscosity. In principle, the rotational viscometer is used to obtain fine measurements of viscosity. However this requires a number of different rotors to cover a wide range of measurement. 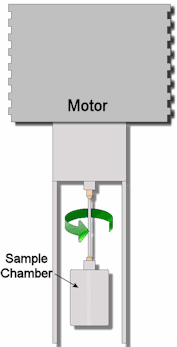 A rotational viscometer works by calculating the torque output of its cylindrical shaped rotor which sits submerged within the sample substance rotating at a constant speed, the rotational viscometer can calculate the frictional force on the rotor caused by the test substance due the the level of extra energy required to maintain its spinning speed. A capillary viscometer is used to measure the rate at which a substance can pass through a capillary (C). The viscometer is usually held in a temperature controlled bath to ensure both the test substance and the viscometer itself do not succumb to any temperature changes which can affect the final test result. 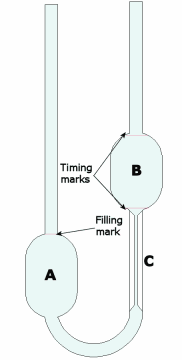 This viscometer works by drawing the fluid up by suction from the lower bowl (A) through the capillary (C) into reservoir (B), the timing marks are used to measure the time taken to fill the reservoir. Above shows Newton’s law of viscosity, however this is merely an approximation which holds true for some materials (Newtonian fluids) but not for others. Non-Newtonian fluids like Oobleck which is similar to cornflower mixed with water for example do not possess a linear relationship between shear stress and velocity gradient. Some Non-Newtonian fluids will become more viscous when stress is applied while some may become less, others react as a result of the length of time that stress is applied. Below is a brief breakdown of the different categories of non-Newtonian fluids. The viscosity index, commonly shown as VI, is an arbitrary numbering scale that indicates the changes in oil viscosity with changes in the oils temperature. The VI scale was set up by the Society of Automotive Engineers (SAE). The temperatures chosen for reference are 100 and 210 °F (37.8 and 98.9 °C) which approximate the temperatures present in an engine when it is first turned on, and then after it has warmed up. A low VI of say 30 means that the oils viscosity will vary greatly as the oils temperature rises from cold to hot, while a high VI of 100 means the viscosity of the oil will be much more stable throughout temperature changes. Oil technology has improved and outgrown the original scale, which only ran to 100 now synthetic oils can achieve VI ratings of over 400 with the help of certain additives. Below is a list of additives which can be used depending on the oil purpose. Amount of additives may reach 30%. The downside to viscosity index improvers being added to oils is that their performance degrades over time meaning frequent oil changes are needed to maintain the target VI. Knowing the viscosity index of an oil is crucial when selecting a lubricant for an application, and is especially critical in extremely hot or cold climates.